Astilbe is one of my favorite perennials for a shade garden. There are not many plants that really like the shade that also flower beautifully, but Astilbe is one of them. Astilbe colors could even be called the stars of a shady garden. Astilbe makes a wonderful border edging plant for a large garden bed. There is nothing quite like the look of their dark green glossy leaves with the huge sprays of flowers sitting above them. It can also be planted in clusters to make a focal center point of the garden bed. It is easy to see why Astilbe has the common name False Goat’s Beard. The shape and color of the white flower spray really does resemble a beard! 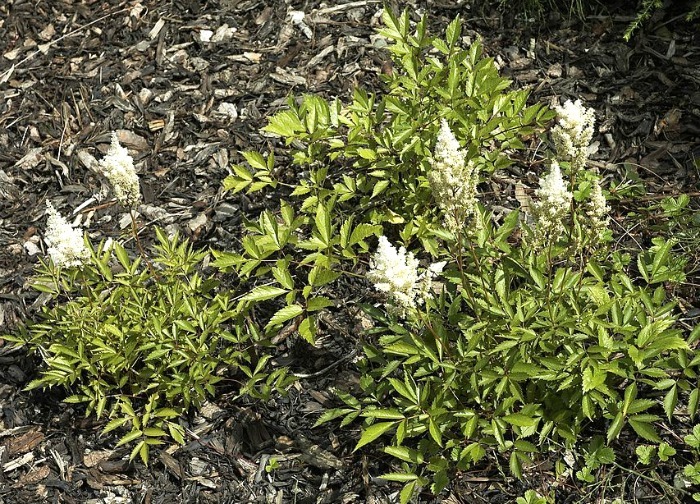 Some species are also known as False Spirea. There is nothing false about the colors though. They are amazing! 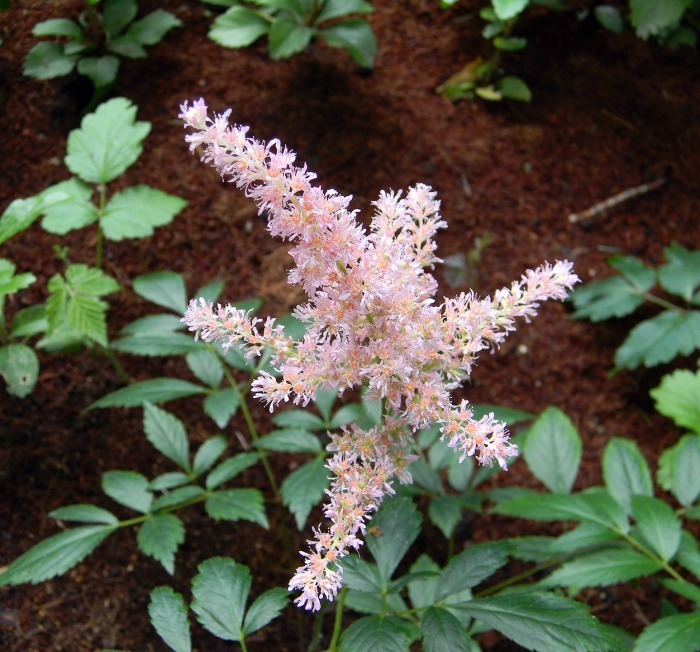 Astilbe is native to the woodlands and ravines of Asia but is right at home here in North America. The flower clusters vary in size from 6″ to about 2 feet and the total height of the plant can be anywhere from 6 inches to 5 feet tall! 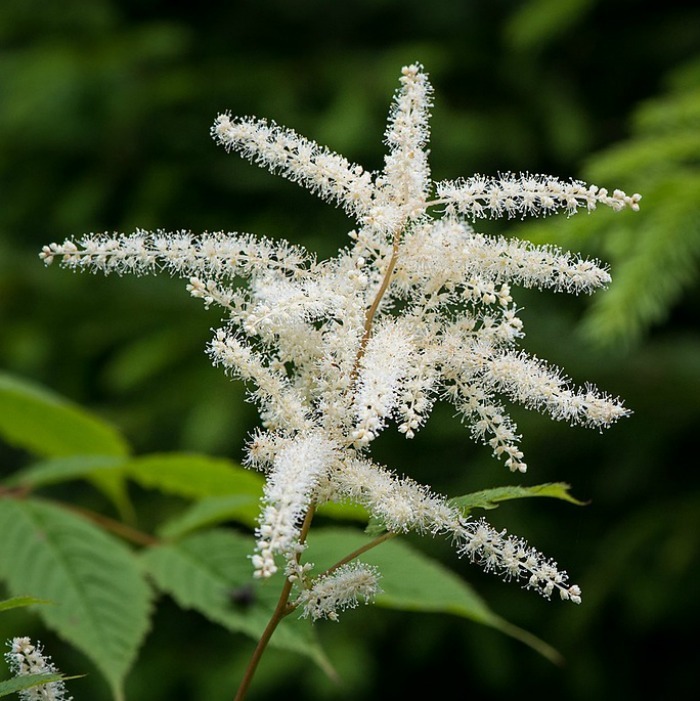 The flowers of astilbe may be frilly, but the leaves are glassy, serrated and green. Most of the time, the flowers sit well above the leaves to make a really impressive show. 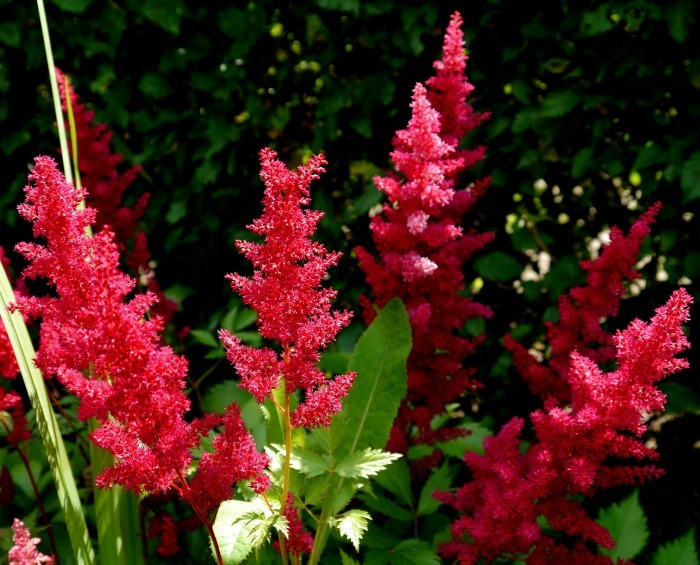 If you have shopped for Astilbe, you may have noticed the word arendsii after the hybrid name. This is because the majority of the hybrids of the plant now available were introduced by Georg Arends, a German who spent decades hybridizing astilbes. 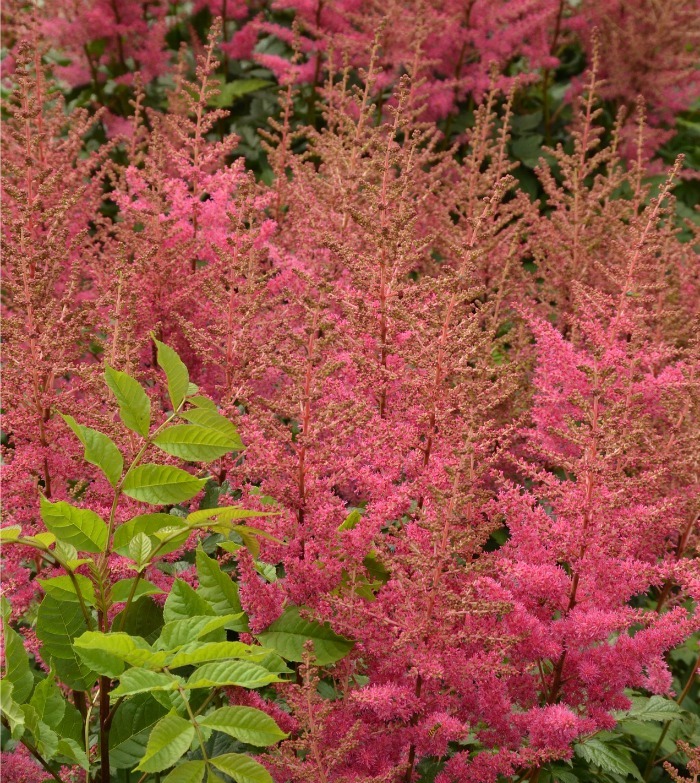 In 1933, Arends introduced 74 different astilbe cultivars and that is just in one year! It took a while for Astilbe to catch on here in the USA, but it’s is a favorite now. The images in this article about the care of astilbe has been shared over 124,000 times on Pinterest! This shows just how popular the plant is here. 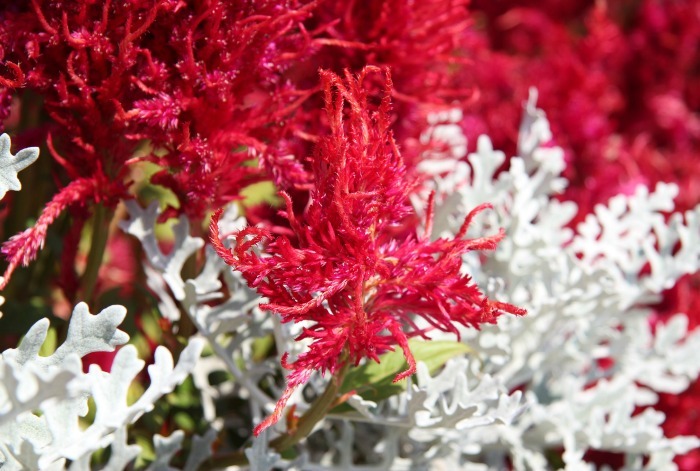 These Astilbe colors may be the main reason why it has taken off. Can you believe it is a shade plant? 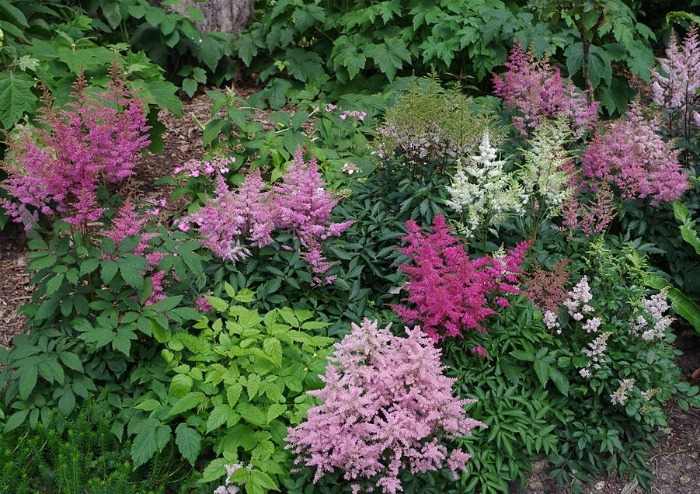 Astilbe comes in lots of color variations from white to pink, peach, red and purple. Each color seems to have an huge variety of shade, as well. Not only do the shades merge one into the other, but the size of the bloom also makes the color either muted or vibrant. The perennial is right at home with other shade loving plants such as these astilbe companion plants. 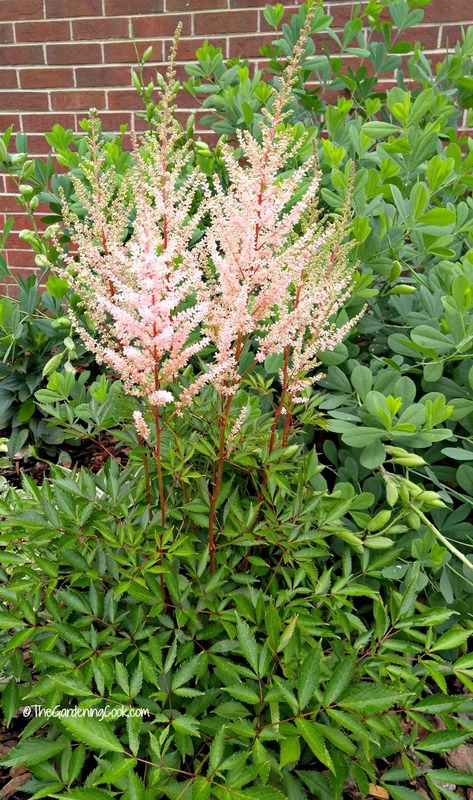 Here are some photos of the popular Astilbe colors. 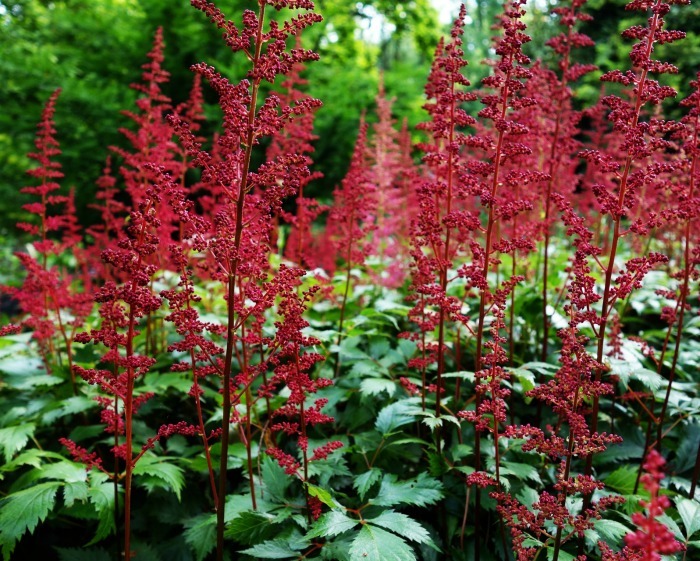 This deep red astilbe shows a good example of the flower petals before they fully open up. It is a shame it doesn’t grow at Christmas time! This pale peach variety was only one year old when I took this photo. The plant was about 4 feet tall at the time and the blossoms were about a foot long. Soft and frilly bright pink astilbe plants sitting in front of a big window. Imagine looking outside and seeing this lovely display? This bright red astilbe is right at home near the white leaves of the dusty miller. What a perfect combination! This bright purple astilbe shows very clearly why it is also known as a False Goat’s beard. Even when the plants are immature, like these white astilbe plants are, the show of flowers is still beautiful. Imagine these in a few years? Pretty in pale pink! This is one of the prettiest astilbe colors that I have seen. It is so delicate! I can’t decide whether these astilbe colors are pink, or peach, or both! Deep, deep red, frilly and stunning. Another Christmas color! When one color just won’t do! This garden bed is full of complimentary colors. So pretty! 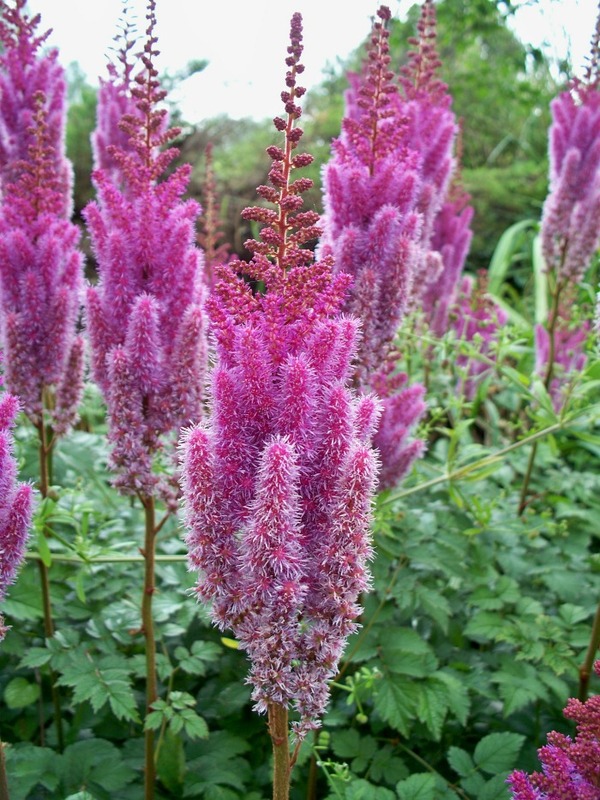 Of all the astilbe colors which is your favorite? 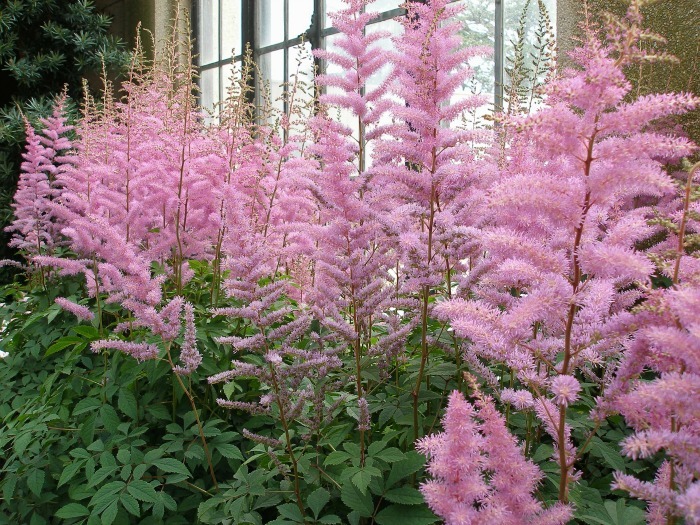 Do you have an example of an astilbe color that I haven’t shown? Please share a photo of it in the comments below. For more information on Perennial plants, be sure to visit my Perennials Pinterest Board. The Astilbe colors are all lovely.I didn’t know it comes in many colors.Amazing! I have a question. When Astrilb first starts to grow after winter, does it start all over or do not expect new foliage to grow off stalks from previous year? I loved reading about your beautiful astilbe plants. 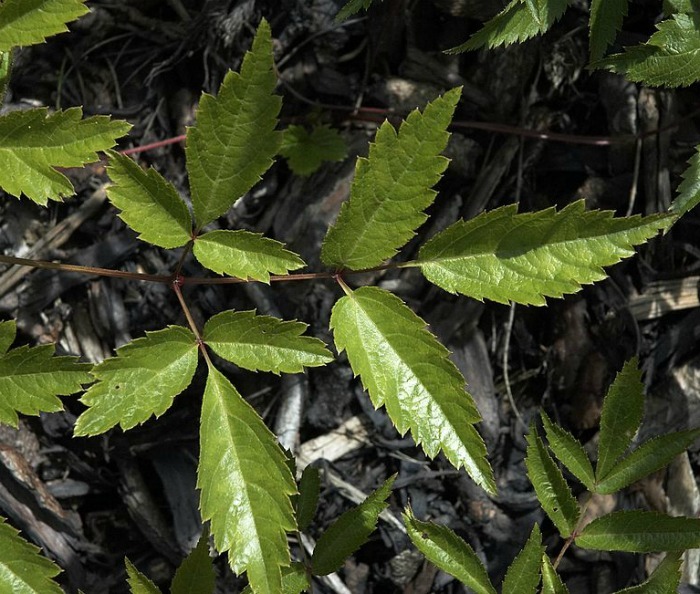 We have lots of camellias and azaleas in our shady yard, but I think we should try adding some astilbe plants this year. Thanks for the inspiration!